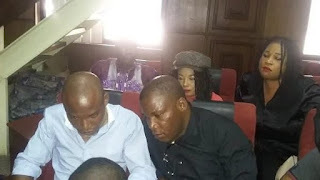 A federal High Court judge has refused himself from hearing treason charges brought by the government against Nnamdi Kanu, the leader of the Indigenous People of Biafra. Justice Ahmed Mohammed announced the decision on Wednesday in Abuja after Mr. Kanu objected to the case, saying it was needless, as the federal government had repeatedly disobeyed previous court rulings. The government is accusing Mr. Kanu of plotting to split Nigeria, by creating a Biafra Republic with south east, south south states, and parts of Kogi and Benue states, as component units. Mr. Kanu, who was arraigned before Justice Mohammed Wednesday, told the court before commencement of the prosecution’s plea that he preferred being held in the detention, than subjecting himself to a trial, which outcome will not be respected. He said his previous trials had various outcomes that were abused or neglected by the office of the State Security Service, SSS. Mr. Kanu therefore stated his outright objection to the trial in the court. The counsel to the prosecution, who is also the Federal Director of Prosecution, office of the Attorney General, Mohamed Diri, told the court that based on section 396 (2) of the constitution, the defendant had no right to object to being tried by the court until after the plea is heard. But the judge said he was standing down from the case, saying Mr. Kanu had the right to reject the trial, “after all justice is rooted on confidence”. “If any of the parties has no confidence in the court, he has the right to say so”, Mr. Mohammed ruled. “I hereby remit the case file to the honourable chief judge of this court to reassign it,” the judge said.